This is a description of the typical Victorian or Edwardian kitchen; the furnishings, the floor, woodwork including skirting and doors, and the décor of the walls and ceiling. The kitchen generally had a wood floor, covered with linoleum often having a tile pattern. The skirting would be dark brown, as would fitted furniture, such as a dresser. The dresser was typically a cupboard with shelves, one of which would be marble to keep food cool, a work surface with open shelves above, and drawers and cupboards below. The walls would be covered with a varnished paper for ease of cleaning. In later years this would be a light, bright colour. By the 1890's, the manufacture of glazed wall tiles had made them more affordable and therefore popular. This very popularity meant that their use became rapidly confined to the kitchen and scullery where they helped with cleanliness. Sometimes there would be a picture rail and, if present, the frieze would be white. The ceiling was typically white. These clothes airers have been a key fixture in Victorian and Edwardian kitchens and laundries and in the decades since. They provide a space-saving and ecological method of drying laundry by using the warm air that becomes trapped at ceiling height. 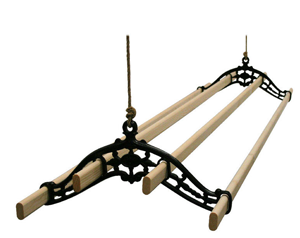 These airer maid clothes airers are functional and decorative accessory for period-style homes. Curtains would have been pretty but simple. The larder had a brick floor and slate shelves. Although the Edwardian kitchen was used by a cook rather than the housewife, it was greatly improved over its Victorian predecessor in both size and efficiency. Carefully ventilated, hygienically tiled and well equipped, it would contain a sophisticated range. A doorway led to a scullery and in many houses to a separate larder and store-room.